➢➢ “The ‘good’ news for Insatiable, the new Netflix comedy that started a controversy the moment the streamer dropped the trailer and cries of ‘fat-shaming’ led to outrage (and a Change.org petition), is that fat-shaming is only one of its many problems. Insatiable is trite, way over the top, unfunny and, running at 40-plus minutes per episode, a bloated mess that’s labour-intensive to get through.” — The Hollywood Reporter. ➢➢ “Insatiable’s best qualities are its quick-paced plot and the fact that it doesn’t take itself too seriously. Its worst aspect though, and one that I view to be an irredeemable one, is the fact that it pretends that any of its messages are intended to help teenagers navigate a cruel world or feel better about themselves.” — The Guardian. 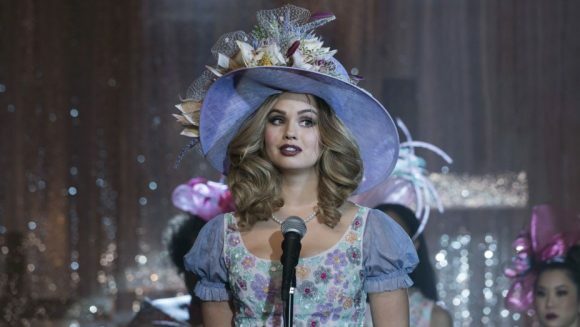 ➢➢ “Insatiable tries extremely hard to throw edgy jokes at the wall, hoping that they will turn the show into a sharp satire of how our society shuns the weak – or something. But despite some late-breaking attempts to right the ship, neither the show’s punchlines nor its characters are sharp enough to transcend their clichéd foundations.” — Variety. ➢➢ “The controversial new Netflix comedy is filled with giant themes about radical weight loss, the superficiality of appearances, identity, parenting, and revenge, but they don’t nearly add up to a coherent message, never mind an affirming message. There’s no there there, when it comes to the show’s broad intentions. It’s just a jumble of provocations, half-baked jokes, random cultural satire, farce, bad puns, and attempted campiness that ultimately doesn’t make a unified point.” — Boston Globe. ➢➢ “Wacky s–t is a lot harder than it looks. Even the Coen brothers don’t get it right every time. Insatiable, on the surface, behaves as if it has tone – ‘Look at me, being all unquantifiable and zany! I’m a TV version of whack-a-mole!’ But without substance, all that clanging and banging is Unsatisfying.” — Toronto Star. What time is this released on Netflix? I’m afraid Netflix doesn’t release timing details, Leo, just the premiere date. Thanks Philip for the reply. It’s August 10 and it’s still not available, I’m assuming it’s tonight at 7pm.